Playing it rough? Lost in a hazard? Different parts of the golf course ask for a different kind of game. The aim of the game – getting from tee to green as fast as possible - is pretty straight forward. Unfortunately, the ball often chooses a more roundabout way to get there. So on occasion, you may find yourself in “uncharted territory”. Some parts of the course have their own rules, like hazards. A closely mown flat area, often on a mount, from which you play your first shot. Each hole has more than one tee box. The color of the markers on the tee box indicate which one you’re playing from. You can tee up your ball anywhere between the 2 markers and up to 2 club lengths behind them (you can be standing outside this area). Short grass between tee and green that shows the actual lay-out of the hole. Hitting your ball from the fairway is easier, because there’s no long grass to interfere with your shot. A curve in the fairway is called a dog leg left or right. Colored markers indicate the distance you have left to get to the green. Quite often, only key distances like 200, 150 and 100 yards are marked. In other cases, exact yardages will be engraved on the sprinkler heads throughout the fairways. Putting surface with ultra short grass that surrounds the hole. Greens vary greatly in size and undulation. “Reading the green” means figuring out which way the ball will turn on the slopes, breaking away from of towards the cup. The type of grass used, the time of day and the presence of water around the green will all have an influence on your line of putting. Once your ball is on the green, remove the flag stick before playing your next shot. Otherwise letting your ball hit the pin will cost you a 2-stroke penalty. Some courses will use different colored flags to indicate whether the hole is in the front, middle or back of the green. The parts of the golf course that are surrounding the fairways, with longer grass and even different kinds of vegetation. The rough is harder to play from, because the longer grass gets caught between the club face and the ball. In “deep” rough, it is recommended to use a higher lofted club to get out of it, even if that means giving up some distance. The hazards are the most feared parts of the golf course because they add strokes to your score. 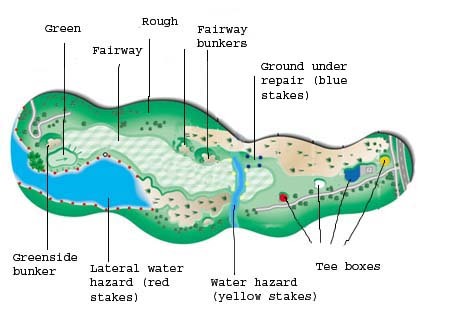 There are 2 types of hazards on the golf course: water hazards and bunkers. drop the ball as far back as you like on the line that extends from the pin through the point where your ball crossed in to the water. In both cases, a penalty stroke is added. drop the ball within 2 club-lengths of a point on the opposite side of the hazard at an equal distance from the hole. Again a penalty stroke is added in all cases. Fairway bunker: is not marked by stakes. It is an indentation or pit in the fairway, filled with sand. No penalty strokes are added to the score. Greenside bunker: sand trap in the immediate surrounding of the green. Playing from this hazard requires a sand wedge and a different set up. The same rule applies for shots from all hazards: you can not set down your club behind the ball before taking the shot. Grounding the club in a hazard would be considered “testing the conditions” and therefore incur a 2-stroke penalty. The boundaries of the golf course are marked by white stakes. Not all courses have out of bounds. Sometimes you are allowed to play your wayward shot from the neighboring field or pasture, although technically they aren't parts of the golf course. Yards from houses on the course are usually off limits. The penalty for hitting out of bounds is “stroke and distance”, which means you need to replay your shot from the same spot and add a penalty stroke. On occasion, parts of the golf course are not fit for play. When a bunker has to be reworked, the sprinkler system needs fixing or part of the fairway is being resodded, the area will be marked by blue stakes. A ball that ends up in ground under repair can be dropped outside the marked area without penalty.